Stupid credit union! Why will you not allow my card to make international purchases! Speaking of, anyone else get there T-shirts yet? Got mine... and despite my careful checking of bloody US to AU sizes(why can't they just freakin standardise), it is just slightly to small. And as I refuse to believe I am getting any fatter in my old age(LIES DAMN YOU), it must be because of the style. Ordered the Toaster Repair shirt the other day. Can't wait for it to arrive. i have to admit the tshirts look quite good. hmm..
second thought... wondering what people think when they read the blood sausage tshirt. explode whom like a blood sausage!? I believe all Jinx store shorts are blank on the back (the official backer shirts say "Official Wasteland 2 backer" on the back). You'd have to check with them to be sure though. Also, there's an edit button. Use it. My toaster repair shirt is indeed blank on the back, with WASTELAND 2 printed on the sleeve. It's pretty nice. 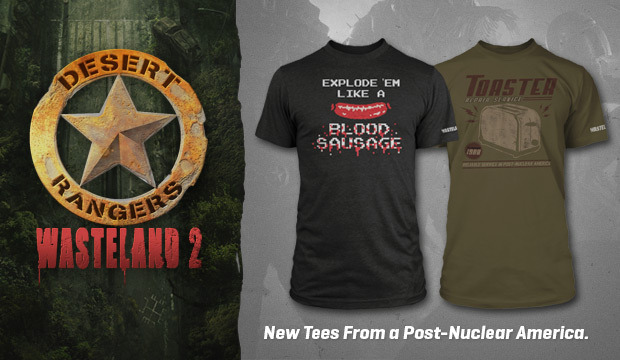 Brother None wrote: I believe all Jinx store shorts are blank on the back (the official backer shirts say "Official Wasteland 2 backer" on the back). You'd have to check with them to be sure though. I checked the link, nothing there..... Sad... Very sad. Again, great game that needs some good merch.